I made it home to California. Karyn and I spent the day together for her birthday. We went shopping at the mall and went around town running errands. Mom and CJ save up their recycling for whoever takes it in when they visit, so I took it in (with Karyn and Bono's help). We made 22 bucks. Woo Hoo. 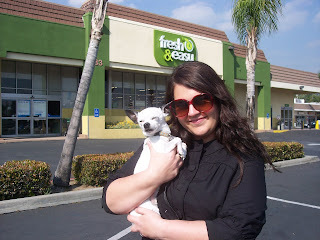 Karyn turned me on to this market called Fresh and Easy. They have mint water and to go fruit and cheese platters. YUM. My saving the earth recycling money payed for my lunch. Bono went on a super long walk and got a bath so he's been pooped out. Too cute. The recycling man told me that Bono was old and I got offended. The nerve, Baby Bono is a young'n. CJ made his famous salmon dinner and Karyn had chicken. We sang Happy Birthday to her and she had a piece of lemon pound cake that we found at Fresh and Easy market. 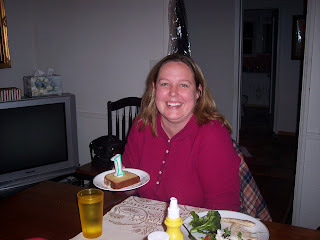 The only candles I could find in a hurry were a 6 and a 1 so I figured the 1 would work because she is our number 1. 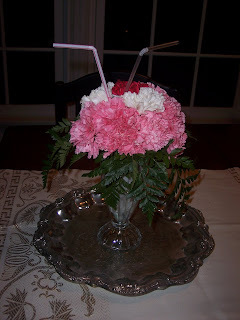 One of the ladies at The Police Department where CJ works made him this Carnation Sundae floral arrangement. I thought it was super cute. I think it would look cool as a centerpiece for an ice cream social. I am so happy to be home. I do miss Daniel though. He left for Utah this morning. He has big plans to go to The Pie for lunch. I'm happy he has his friend Will with him to keep him company. They are both presenting papers at Utah State University tomorrow. I love Fresh and Easy. But, I think I love it more now that I've seen that picture of you and Bono in front. Happy Birthday, Karyn! I wish I could have been there to join in the celebration! The pound cake looks good and you are def. number one.